The German electronic music pioneers will make their debut at the Scottish festival in July, performing alongside headliners such as Mumford And Sons, Rihanna and The Killers. The festival, at Balado airfield in Kinross, celebrates its 20th anniversary this year and is expected to attract 85,00 revellers per day. Kraftwerk were at the forefront of synthesiser pop and had a huge influence on dance music in the late 1970s and early 1980s, as well as scoring chart hits with tracks such as Autobahn and UK number one single The Model. Coldplay took the main riff from Kraftwerk's 1981 track Computer Love for their single Talk. Kraftwerk, whose name translates as "power station", are playing a rare series of sold-out shows at the Tate Modern gallery in London, where they have been performing their albums in chronological order from Autobahn onwards through releases such as Trans-Europe Express, The Man Machine and finishing with their most recent collection, Tour De France Soundtracks. Their performance at T In The Park is expected to include 3D visuals, animation and projections. 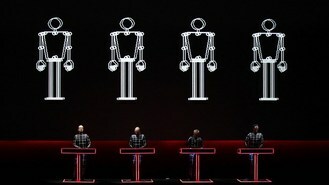 Geoff Ellis, festival director, said: "Kraftwerk are a truly seminal band. Their revolutionary sound altered the face of contemporary music and paved the way for so many artists across so many musical genres. "They are a massively influential group and an incredible live act, and we are hugely excited to welcome Kraftwerk to T In The Park for the first time this July, in what will be a very special moment in our 20th year celebrations." Emeli Sande, The Script, Two Door Cinema Club, alt-J, Paloma Faith, Jake Bugg, Of Monsters and Men and Azealia Banks are also confirmed for the festival. Tickets for the festival, which takes place over July 12-14, go on sale on Friday February 22. For more information visit www.tinthepark.co.uk.